Mother’s Day is approaching and this year I’m looking forward to my gift even more than usual because I already know what it is. I’m getting a new digital camera! I have one, I’ve had one since 1997 or 1998 when we got our first Kodak digital camera from my mother-in-law (who is not tech-savvy but was QVC enabled. She figured since we had a computer we needed this new fangled camera, too. Back then, that camera held all of 10 pictures. I’d take the 10 and then upload them to my computer and do it again. I got a few developed on Shutterfly and would get some of the pictures developed and sent to me in the mail. So long 35mm. Hello digital photos. I was thrilled to be able to get the pictures I wanted instead of paying to develop 3 good photos along with the 21 not-so-good photos. Ten years and two digital cameras (another Kodak and then a Samsung) later, I’m moving on up to a bigger, better camera. The last one we’d purchased (the Samsung) was a great deal, but it turns out I’m not a fan of a tiny camera with no eye-viewer-thingy. It zooms but whenever you use zoom the picture’s blurry because the camera is so tiny that the act of pushing the button to click the photo causes enough movement to totally ruin the shot. I’d debated getting a Nikon D40 or D80 SLR, but couldn’t convince myself that I knew enough about what I was doing to go that route. While I desperately hate the tiny credit-card-sized cameras, I also didn’t want to be toting around a huge camera bag and multiple lenses while out and about at baseball games and amusement parks. So I looked around and decided on an Olympus SP-570 UZ. I’m hoping it will combine the best of both worlds, since their description is “Body of an ultra-zoom. Soul of an SLR.” Be sure to visit the Olympus product page because it’s fun to click and drag the camera to view it from different angles. It rotates 360 degrees but, sadly, doesn’t rotate up or down. So, my mother’s day memory? 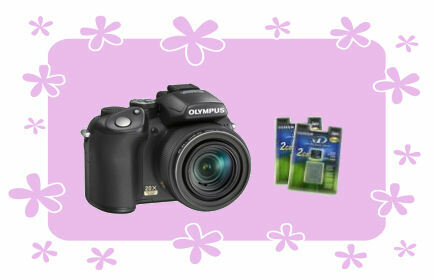 Well, it’s an Olympus/Fuji 2GB xD Picture Card Type H. What were you expecting? A sappy story? But we didn’t buy the memory from the same retailer we bought the camera from, the prices were just too high! Instead, we found a great deal over at MemorySuppliers.com! MemorySuppliers is obviously a site devoted entirely to flash cards, digital SD cards, xD picture cards and multimedia MMC cards. Well, okay, they also sell batteries and chargers. We actually bought two memory cards because the price was so good (and I had a 15% off coupon code to use). On previous mother’s days I’ve gotten a grill, a cordless drill, and a step ladder. Granted, I like to eat, had asked for my own drill, and needed the step ladder to reach the top kitchen cabinets, but this year… I’m way too excited about getting my new camera and all that memory. The suggested retail at the Olympus site is 499.99 but my husband found it online for lots less of course. In case you’re interested, he ordered it from TECHONdigital. EDITOR’S NOTE UPDATE May 10th, 2008: Do NOT buy a camera or anything else from TECHONdigital. As a matter of fact, read TECHONdigital.com’s A Scam! to make sure you don’t get suckered in like we did… I really hope MemorySuppliers is not a scam as well, but I’ll let you know how that goes after I get over being an idiot and falling for the bait & switch from TechonDigital. We got the Nikon D40 for Christmas (a family gift) and it was our first digital. I love it, but am still learning about all the features.